Sara Grossman interview Elsadig Elsheikh for an episode of the Who Belongs? podcast. The Haas Institute strategic communications team is behind the production of audio and video supplements that help synthesize and spread our research to wider audiences. In Fall 2018 we launched a regular podcast called Who Belongs? produced and hosted by members of the communications team. 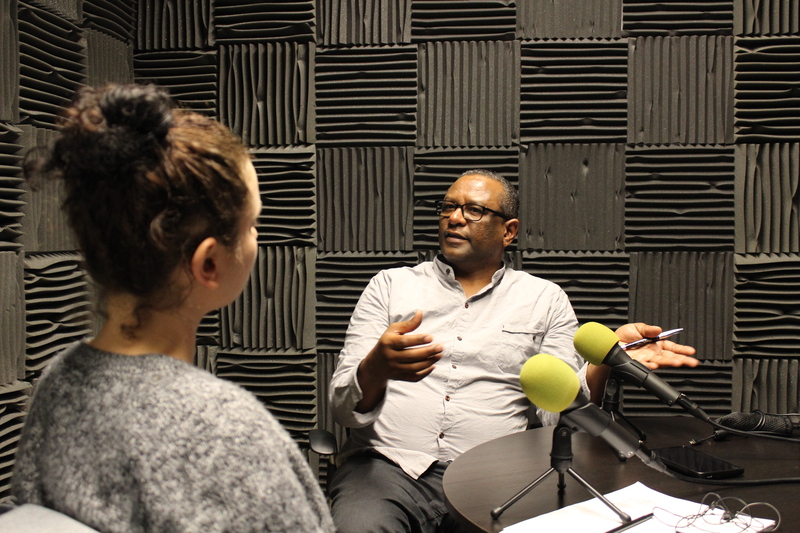 The podcast focuses on the work being done both at the Institute and outside of it to address issues related to social inclusion and exclusion. We also produce audio recordings of talks and interviews on a variety of issues with scholars, activists, and others which are regularly posted to our SoundCloud account here. Video recordings of nearly all our talks, conferences, and public events can be found either on our video page here, or our YouTube page here. In addition to talk recordings, we also have several explainer videos including animations that break down some key concepts and framework ideas at the Haas Institute, including the "Circle of Human Concern," "Targeted Universalism," "Bridging & Breaking," and our position on race in college admissions, our approach to community-engaged research, and many more. For inquiries about our multimedia division contact Marc Abizeid at marcabizeid@berkeley.edu.